Our least costly model, the classic TC-400GL has received a major makeover and upgrade. This new generation is quieter, has flatter response and comes with an external power supply that is usable worldwide, regardless of country. 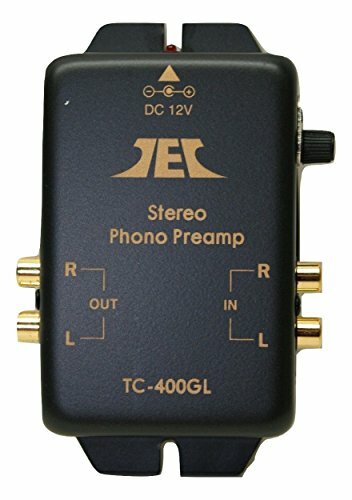 If you're looking for a phono preamp which you can hide behind your equipment and forget, this is it. Simply connect your turntable to the input, connect the output to a receiver /amp line input (CD, AUX, TAPE etc) using the supplied cable, and start listening to your vinyl! This is an excellent choice for use with music systems, soundbars, and home theater receivers that lack a phono input. See the installation manual PDF (link below) for more info on compatibility and function. If you have any questions about this product by TEC, contact us by completing and submitting the form below. If you are looking for a specif part number, please include it with your message. Electronics-Salon Stereo Phono RIAA Preamplifier Module Board, Preamp, MD-A310.